Curriculum and Instruction, M.Ed., Ed.S. The Curriculum and Instruction program, leading either to a Master of Education (M.Ed.) or a Specialist in Education (Ed.S.) degree is designed to foster the development of teaching skills that result in increased pupil performance. By analyzing curriculum choices and strategies, along with best teaching practices, those who complete either of these programs will be better equipped to provide an environment in which students engage in relevant and meaningful learning activities. Upon enrollment in a Curriculum and Licensure program, students will select either the research path or the practicum path. 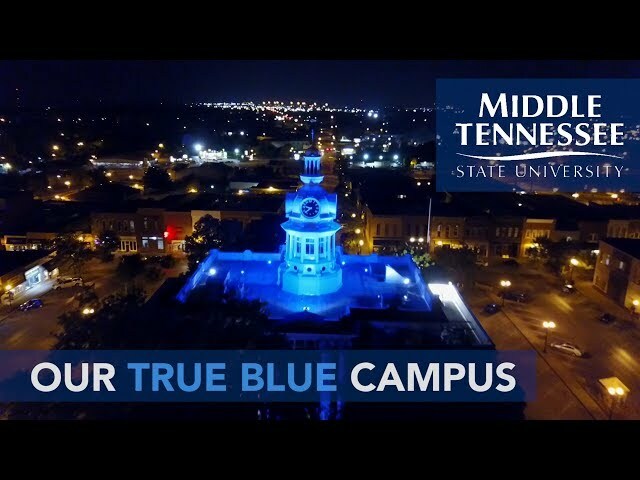 MTSU offers a specialization in secondary education licensure. This specialization offers a path for non-licensed degree-holding individuals seeking licensure to teach in secondary public schools. The Womack Educational Leadership department also offers a non-licensure generalist Curriculum and Instruction major. Terry Weeks, a full-time professor and graduate of Middle Tennessee State University, exemplifies the excellence of the Womack Educational Leadership department. Weeks is the only National Teacher of the Year in history to hail from Tennessee! This is quite an accomplishment considering that the Council of Chief State School Officers created the program more than six decades ago in 1952 in an effort to highlight and reward excellence in teaching. Weeks was teaching social studies at Central Middle School, Murfreesboro, in 1988 when he was named National Teacher of the Year. He had graduated from MTSU in 1972 with his undergraduate degree and in 1974 after completing his master’s in Curriculum and Instruction. He had a tremendous impact on individual schoolchildren while he was a classroom teacher, as well as an impact on the profession as a whole. Weeks works diligently in his role as a professor within the Curriculum and Instruction program to prepare the teachers of tomorrow. His students are taught to go out into the workforce and take jobs in classrooms across Tennessee, the South, and the nation. “Living in a rural part of southern middle Tennessee has many perks, but the downside is that you are quite a drive from most activities,” says Kim McFall of Collinwood, who began teaching in 1985 and finished her master's in 1988 before having a family. “With the added responsibilities of children, it never seemed feasible to pursue an advanced degree. Several different times, I sought programs that might fit into my schedule, but that became increasingly difficult especially after I accepted a 12-month position outside the classroom,” she remembers. In 2012, a fellow teacher contacted her about joining a cohort seeking an Ed.S. in Curriculum and Instruction. “I hesitated to make the commitment, but at the very first meeting I was assured that the professors would work to help each student succeed,” McFall says, adding that they received their degrees in Spring 2014. “It would not have been possible had the classes not been brought to my home county! I was amazed at how much I learned from our professors as well as the others in our cohort. The program is designed for teachers who are working on the front lines, allowing them to readily implement the concepts and practices being discussed. This creates a perfect balance between instruction and practice, theory and practicality,” McFall says. More recently, both her niece, Ragan Greer, and her daughter, Amelia McFall Baer, have pursued additional degrees through cohorts that brought classes to them. “MTSU has helped my family of teachers sharpen their skills and be better informed, more knowledgeable educators,” McFall concludes. The Womack Educational Leadership Department offers the Specialist in Education degree (Ed.S.) with a major in Curriculum and Instruction with both on- and off-campus cohorts. A Master of Education (M.Ed.) with a major in Curriculum and Instruction is offered. Specializations include secondary education licensure, offering a path for non-licensed degree-holding individuals seeking licensure to teach in secondary public schools. The department also offers a non-licensure generalist Curriculum and Instruction major. Also available under the Curriculum and Instruction major is a concentration in English as a Second Language leading to an M.Ed. The department offers the Ed.S. with a major in Curriculum and Instruction and a specialization in Culture, Cognition, and the Learning Process. Under the Administration and Supervision major, Womack Educational Leadership offers the M.Ed., as well as a concentration in Agricultural Education Leadership. Administration and Supervision programs leading to an Ed.S. include specializations in Higher Education and Instructional Leader Licensure. The M.Ed. in Curriculum and Instruction offers a concentration in English as a Second Language and a specialization for the professional education coursework needed for teacher licensure (secondary education licensure path). The Curriculum and Instruction program is designed to foster the development of teaching skills that result in increased pupil performance. By analyzing curriculum choices and strategies, along with best teaching practices, those who complete this program will be better equipped to provide an environment in which students engage in relevant and meaningful learning activities. teacher licensure—the licensure requirements may be waived in special circumstances. Students pursuing an M.Ed. degree must be fully admitted to the program prior to the completion of their initial semester of coursework. submit official scores on the Graduate Record Examination (GRE), Miller Analogies Test (MAT), or Praxis II or a copy of the teaching license. Emphasis on examining current issues and trends in teaching and learning. Assessing standard teaching practices, analyzing the relationship between effective teaching and effective schools, and developing strategies for instructional and school improvement. Includes experiences to help students become more reflective in their daily teaching. For the advanced major in curriculum development utilizing small group or seminar approach. Issues and research in curriculum improvement analyzed critically. Concepts, processes, and skills related to curriculum development and evaluation. Development of creative approaches for secondary classroom teaching in order to stimulate creative and critical thinking abilities of students. Offers preparation for incorporating microcomputer technology into the K-12 school environment. Student designs a computer-assisted instruction project by applying the microcomputer skills and understanding acquired. Basic concepts in educational measurement and evaluation; evaluation as a part of the teaching-learning process; utilization of evaluation for instructional improvement. The Ed.S. in Curriculum and Instruction major offers a specialization in culture, cognition, and the learning process. submit official scores on the Graduate Record Examination (GRE) or Miller Analogies Test (MAT) or copy of valid Tennessee Teacher License.